As I write this it does not seem possible that my first Ag App Blog was written over five years ago. https://osunpk.com/2013/07/30/agriculture-app-for-the-ipad-and-iphone/. 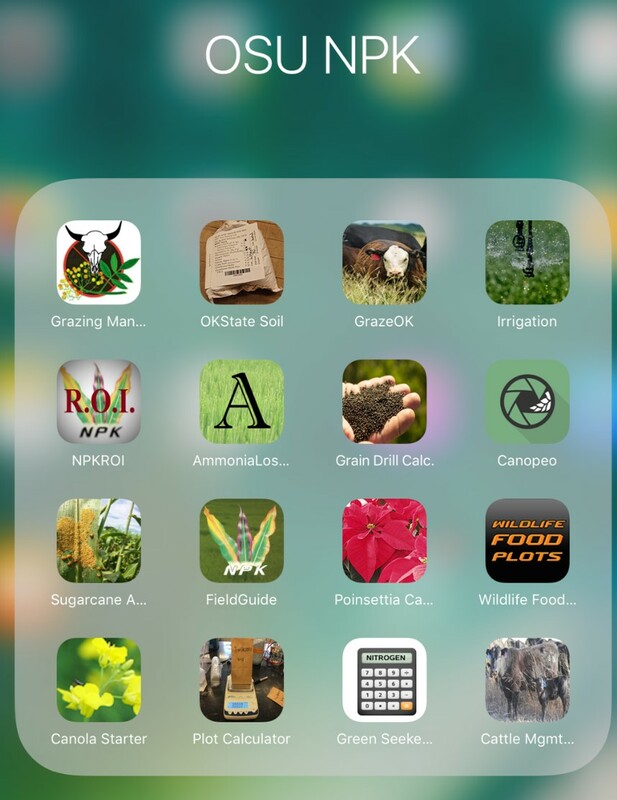 When I wrote that first blog I had 76 apps on my iPad a year later I had over 200 apps on the same iPad posted the third app focused blog https://osunpk.com/2014/12/09/agriculture-apps-200-strong-and-growing/. Today I still enjoy looking for apps and I am also having a lot of fun developing apps. 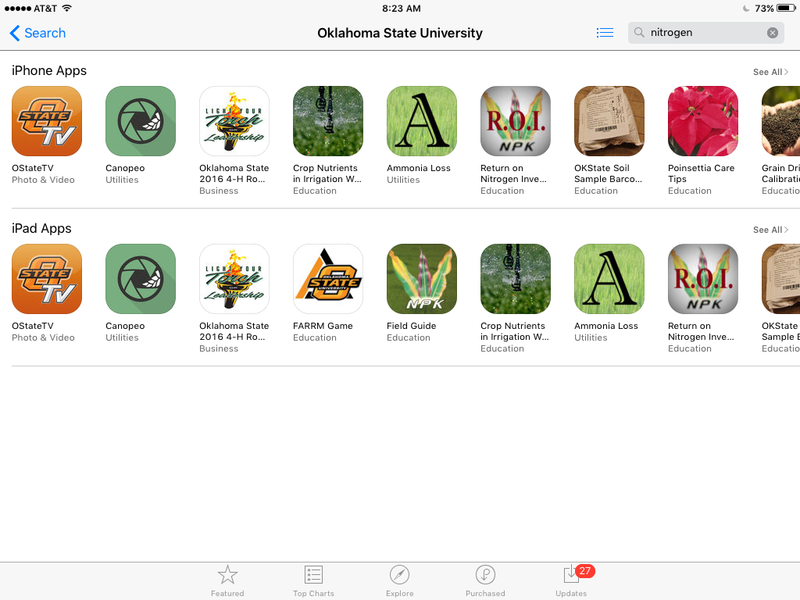 With a team of computer science students we have released twenty eight apps in both iOS and Andriod platforms http://www.dasnr.okstate.edu/apps. After I had picked up a few new apps, broke the 300+ mark, I found that my five year old iPad 2 was not quite as quick as it used to be and I had to upgrade prior to doing my Scouting App Review https://osunpk.com/2017/08/03/scouting-app-review/. Even after 300+ apps I still have a few of the same original suggestions, like the general rule of thumb “If I cannot figure it out in 3 minutes it’s GONE. An app should be intuitive, easy to use and have a purpose. They only exception to the 3 minute rule is the Scouting and Mapping Apps. Because of their complexity I allow them 5 minutes, and then I am done. Any app with GIS in its name gets much more time”. As far as searching for apps terms such as Corn, Soybean, and Wheat return more games and dietary apps than useful ag apps. Multiple key work searchers is important. If you find a good app go into iTunes or Google Play and check out the other apps created by the developer. Chances are if the developer has made one app you like there will be other well suited to your needs. See a list of all apps created by the developer. But to be honest as you can expect of those 300+ apps 95% only get opened when I have to give a talk. Recently I have had request to update my list of apps but instead of spending the countless hours organizing my thoughts on the 300+, I decided on just sharing with you those apps which have made their way onto my cell phone because I do use them. Many of these are on my original blog 5 years ago. Tank Mix is a handy app that allows the user to create chemical inventories, plan spray jobs, share the details and save for later. Minus wading through the list of chemical this is a very intuitive app and provides a great deal of information. The ability to create a library of chemical and application really streamlines the systems. Spray Select was the first app I downloaded. While over the years it has had its fair share of bugs, in my line of work this app is a gem. In a day I may go from spray a contact, to a fertilizer, to a systemic. Not to mention the wide range of GPAs I run at. Being able to to select my speed and GPA then have a list of tips and droplet sizes makes this app critical for my project. I primarily use TeeJet but if you use Hypro check out AgPhDs SprayTipGuide, if you use Greenleaf download NozzleCalc, JohnDeere has an app for their nozzles also. 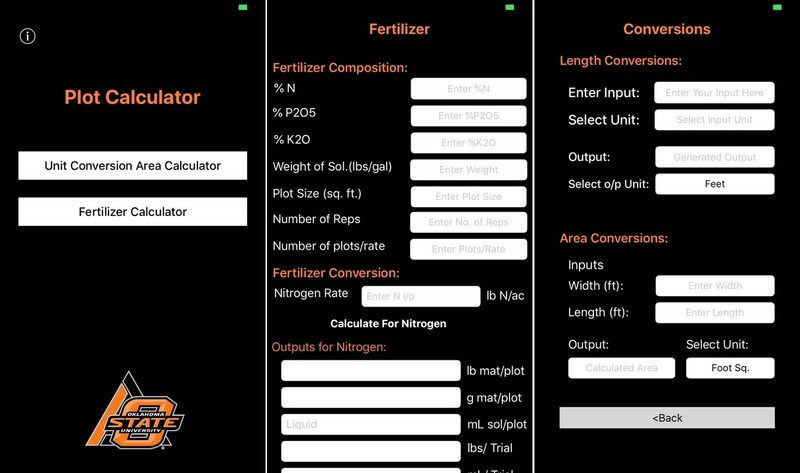 I have two Nutrient Removal Calculators on my iPhone the Fert Removal from AgPhD and Nutrient Removal from IPNI. 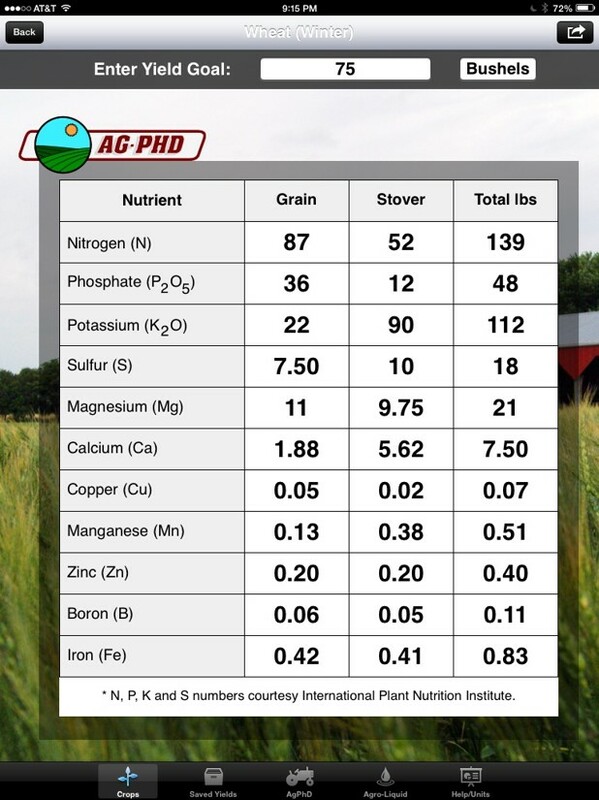 I give Fert Removal the leg up because it provides nutrient values for more than just the macro nutrients. The AgPhDs put out another nice app in Deficiencies. Nice funcitonality but image library is a bit limited. It is my hopes that they are adding to this over time. Much like with the nutrient removal tools I give second runner up in this group to the IPNI PlantImages app. It has a larger image data base but at the time of this blog it needs updating and is not functioning on all platforms. Both apps are on my phone and are great tools for someone new in the field, or someone who has been around a while but who’s client needs to a see a second opinion. 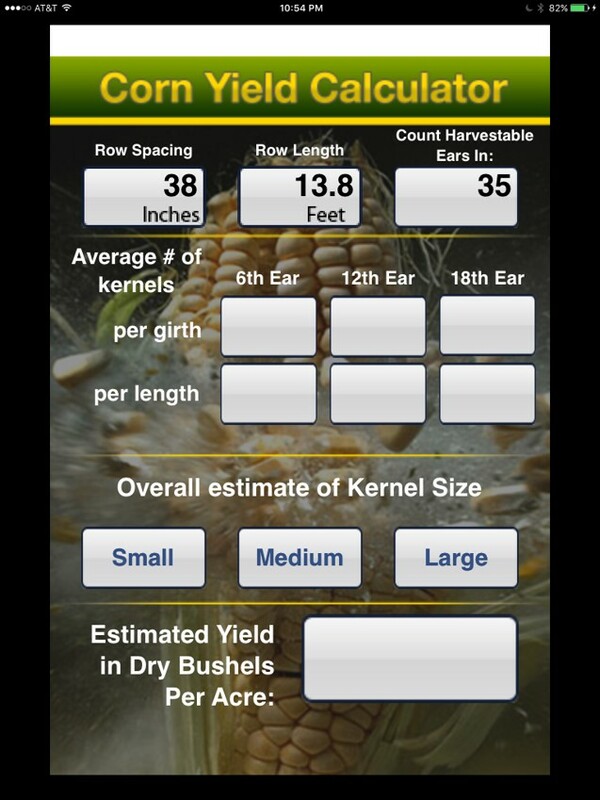 I like the easy of use for of the Corn Yield Calculator. It is a quick, easy, and clean way to estimate yield. However when I pulled the links for this app it seems as though since I first downloaded the app, a fee has been added, $2.99. For some of you it may be worth the charge. However University of Wisconsin has a nice app named Crop Calculators. It has several functions but the UI (user interface) is not as clean. 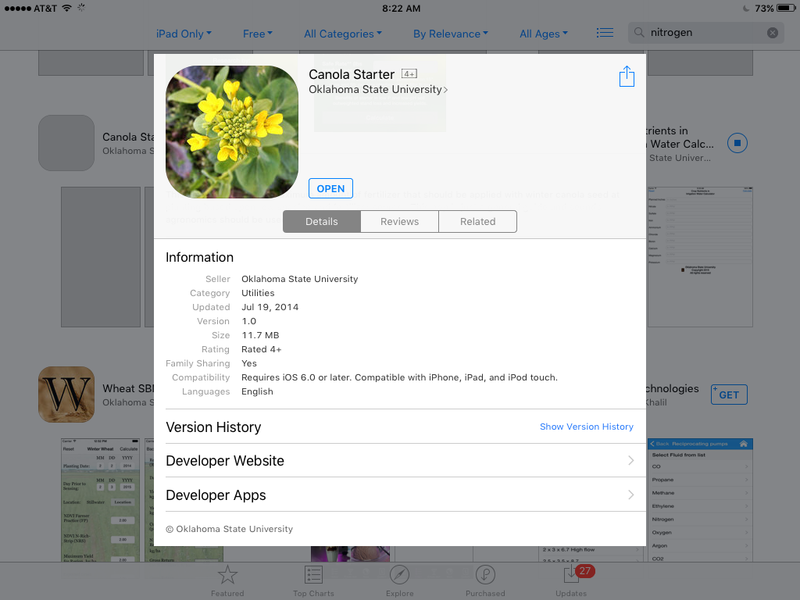 Another app by the Ag PhDs is on my list. For me the Harvest Loss App is what I use as an example for the perfect “app”. Harvest loss allows the user to choose the commodity and current price. Then the number of grains found in a square foot after harvest is counted. This provides an economic value to properly setting a combine. What more powerful tool than money lost is there to impact change. These are not the only Weed Identification apps, but they are my favorite. University of Missouri’s IDWeeds was the first of its kind and has made some fantastic improvements over the years. 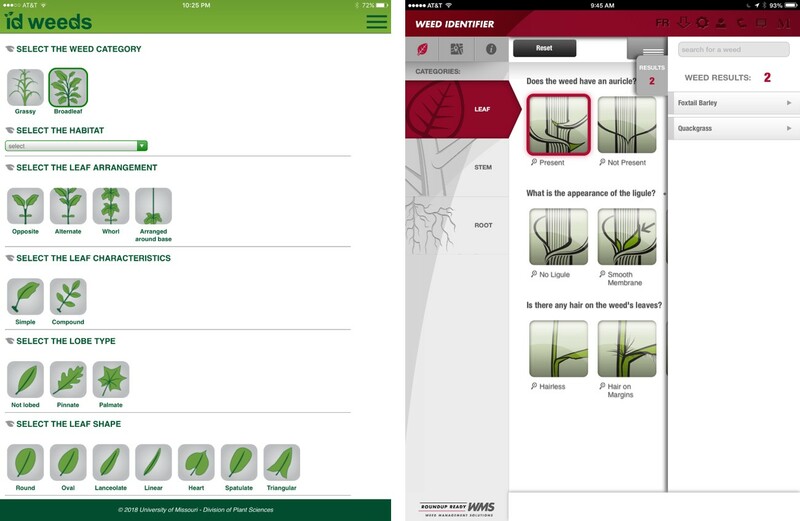 Monsanto’s WeedID app is, IMHO, one of the cleanest and nicest user interfaces available. Both function similarly, the user selects grass or broadleaf, then chooses the appropriate physiological features of the weed in question. A list of weeds fitting the description is compiled. Pictures and more in-depth descriptions are available. 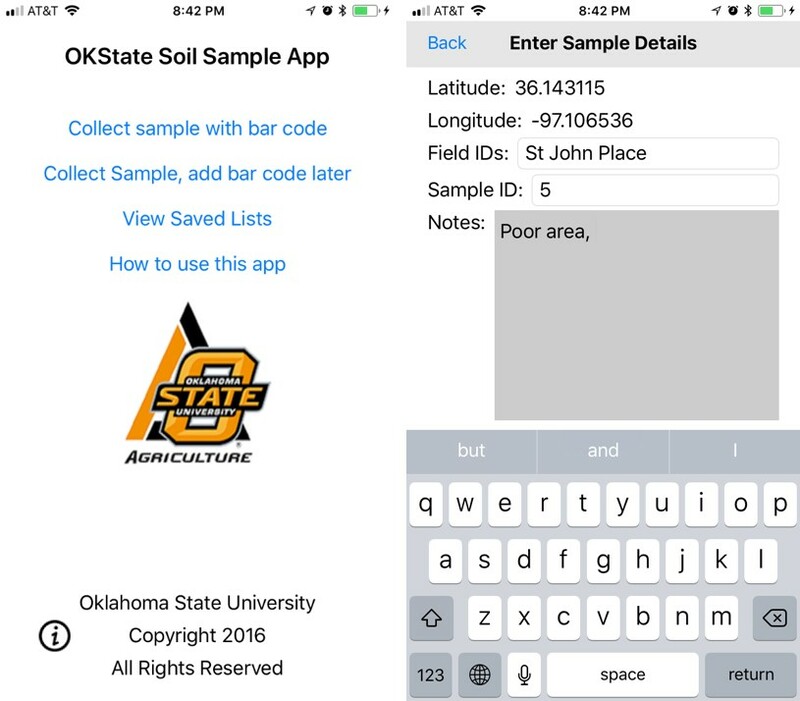 While this app is built for the UK, being in the southern Great Plains wheat is king and this is a very useful app when it comes to cereal disease. While it does not have a good ID tool it has a great list of diseases, images and very in-depth descriptions. This app just makes me smile. But it really does have some great features and could be quite useful or any cattle producer. 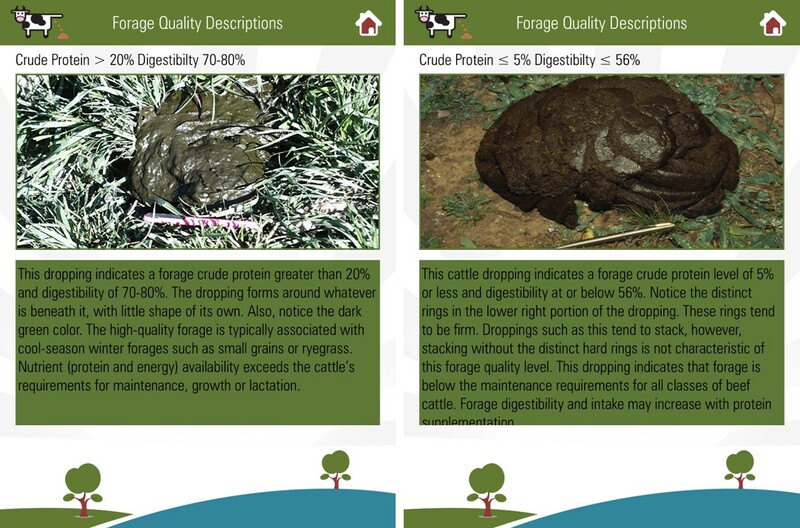 By considering the consistency of the pile the quality of the forage/feed can be estimated. While Canopeo is not mine its the best thing since sliced bread. This app uses the camera on your phone or tablet to get a % canopy cover. The Android version even has a video version. The applications for this app are endless. Designed for individuals who send samples to the OSU Soil, Water, and Forage Testing Labs (SWFAL). User can collect the GPS location of a sample, add notes, and tie it to your lab ID and sample number via a barcode. I know some who just use this app to get Lat Longs from sample points. At this point the app is not tied to the Lab system. But a file can be emailed with all of the saved data. 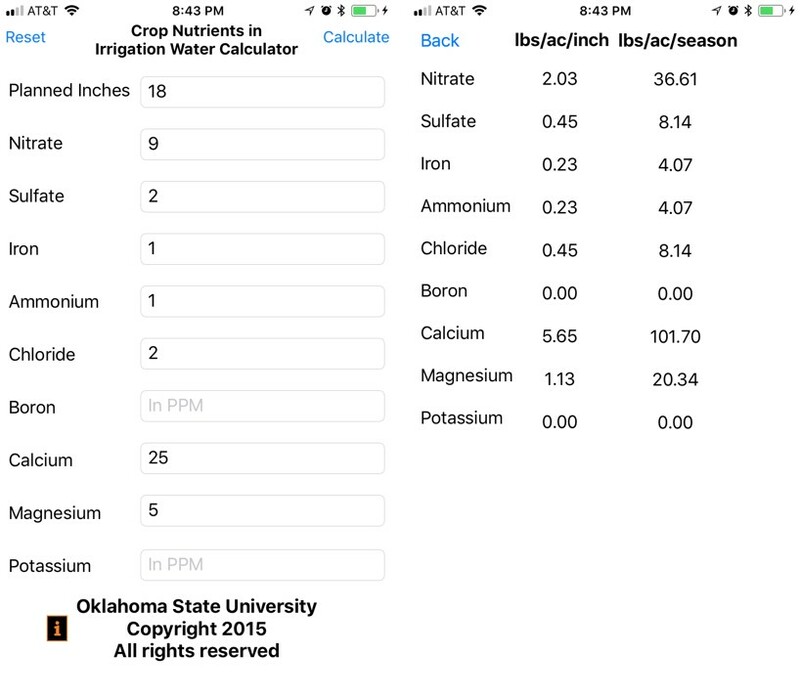 Simple calculator that will calculate annual nutrient additions when you have a irrigation water test. 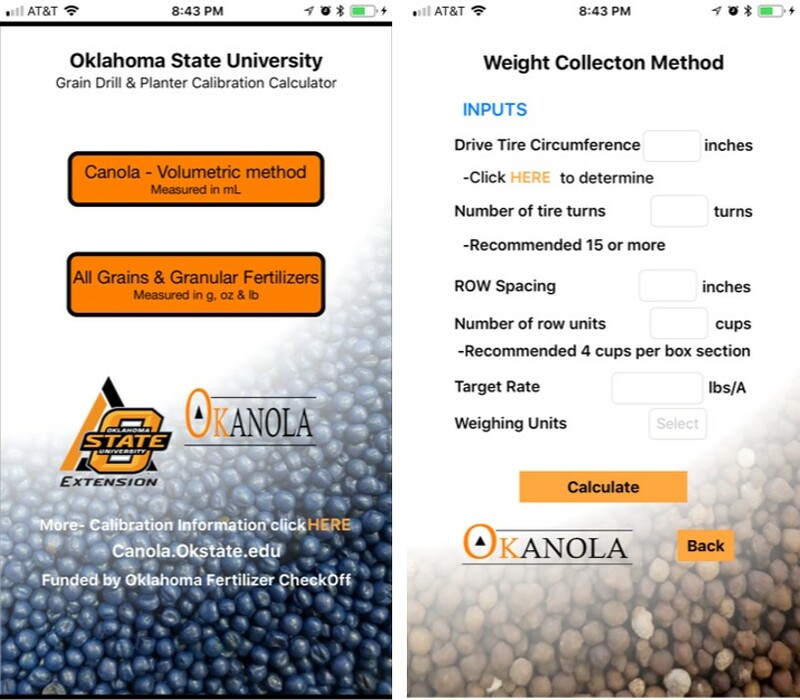 Handy app built to help calibrate grain drills to sow canola with the added function of determining rates of other grains and fertilizers. 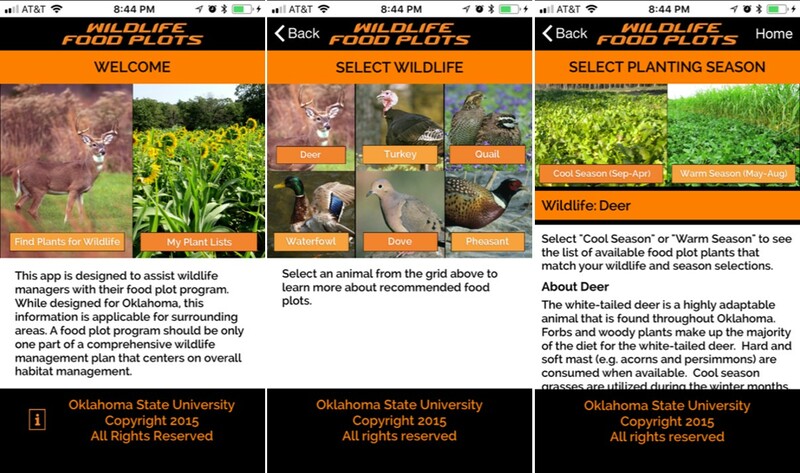 Non Ag but extremely popular app designed for a DIY food plot. Pick your species of interest and planting window and a list of applicable plants and their agronomic recommendations are provided. Lists can be saved and shared. Built to help graduate students prep fertilizer for plot application. The app also has a unit conversation calculator. By osunpk in Agricultural Apps on May 16, 2018 .